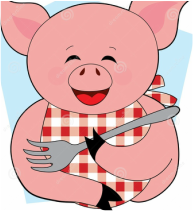 Pigs love to eat and the proper type and amount of food he/she gets is very important. There are several companies that make mini pig chow. ( HOWEVER WE DONT USE ANY OF THESE , WE FEED ALL NATURAL DIET) .The most popular feeds are Heartland, Peak Performance, Mazuri by Purina, Nutrina and Manna Pro. *** WE DONT FEED BAGGED PELLET FOOD !!! **** never use hog/swine food ,it has steroids in it for feeder pigs. Try and remember that these pigs are Omnivore not Herbivore. They cannot make their own protein. That is why it has to be fed to them and they will get that in their food. In the wild the protein would come from; dead animals, worms, bugs, etc. As long as the pig gets its normal feeding of the pig chow things are OK, but a pig fed nothing but fruits and veggies will have problems. Part of good pig care is proper diet. Feed your pig at least twice a day. A general guide is piglets should be fed on a free-choice basis (as many times as they want) or about 1-2 cups of oats and grains (EACH MEAL) from 4-6 weeks old (or as soon as pigs will nibble on it) until 1 year old. At around 1 year you may need to decrease the amount slightly. This will depend on your pigs metabolism and activity level. Each pig is different. Avoid feeding your pig Dog or Cat food is made for cats as dog food is made for dogs. They do not have the proper nutrients for your mini pig and the protein level is too high. If your pig constantly goes back and forth between the food and water bowls then you may want to either put the water bowl farther away or put some water on piggy's food. Food amounts need to be cut down if your pig is able to graze a great deal. For instance, in the summer months my pigs are outside grazing all day so I can cut back on the amount of food I feed them. Usually I will cut it in half. In the winter we increase the amount we fed as they need that extra protein to burn off. Please do not feed your mini pig unhealthy "people food" or you will end up with a fat and unhealthy pig. Give your pig one NUVET chewable vitamin daily. Your pigs overall health and appearance are the best guides to determine the proper amount of food. Basically, when it comes to diet, good care of potbellied pigs is pretty much the same as good care of yourself. No sugars, low fat, do not overdo it with feeding! The key is moderation. •Fruits: High in calories from fructose. •Corn: High in sugar from fructose. •Potatoes, Yams, Sweet Potatoes: Starchy and high in calories. •Spinach: High in sodium, is okay if pig has clean water to drink. Some of the most popular treats used are Cheerios, bite size shredded wheat(not frosted), granola bars and plain, un-buttered, un-salted air popped popcorn. Pigs love cheese so make little rolled balls as treats. Please, do not feed your pig chocolate!!! There are some reports that chocolate can be deadly for pigs, so better safe than sorry! In fact, try not to feed your pig any candy at all. Make sure your mini pig always has access to clean drinking water. It is as important to them as it is to us. I always leave out clean fresh water. Even in cooler weather pigs will need to have drinking water available. Keep in mind that there are times of the year when pigs will drink more. Winter is one time. Many pigs drink much more in the winter than normal. Or, if it is abnormally hot, some pigs may increase their water intake, so make sure you keep them supplied with clean, fresh water. Actually the only place they 'sweat' is out of the top end of their nose! You will see little tiny droplets of water forming there,so don't think they have a cold,thats were they do sweat. To help them keep cool during those hot summer days you will need either a kiddy pool (those cheap blue plastic ones you can find at Walmart or Dollar General) or a nice mud hole. Rolling around in the mud hole cools them off by covering them in cool mud. Plus, caked on mud keeps insects from getting to their skin and works as a great sun screen. *nuts fed as treats - very high in fat so watch the fat! Vegetables make up the bulk of your pigs diet. Yams/Sweet potatoes, these are a great source of nutrition, GREENS AND LOTS OF THEM (no ice burg lettuce, it has no nutritional value) red leaf lettuce, green leaf, spinach, kale, any green veggies. carrots, corn(in moderation) , beans and any vegetable you may buy for your family. The piggies will eat skins, peels and parts we don’t. Avoid white potatoes they have more starch than a pig needs. Fruits are great for your pig but keep in mind these are sugary and shouldn’t be used in large amounts. Any type of fruit cut up to bite size pieces; bananas, apples, oranges, no-grapes, mango's, cherries, peaches, strawberries, melons, blue berries etc.. They love watermelon and strawberries, they will eat the parts we do not. ( they now have whole wheat cheerios) or any whole-wheat cereal without added sugar, No frosted cereals. Plain Greek Yogurt - ****** A FAVORITE !!!! Divide "plain" greek yogurt up into a couple tablespoons per day. They love it mixed with oatmeal! It gives them some protein and is the right balance with their diet, it also provides many health benefits. I have been crushing the daily vitamin and mixing into the yogurt because they are yet to eat the vitamin on their own. *Be sure to combine these and more protein sources to achieve 14-16% of you pigs protein needs.Oats & cereals, unsalted peanuts, almonds, beans... can be lima beans, black beans , soy beans etc.... Greek yogurt, cottage cheese, spinach, broccoli, field peas are a few examples for you to try. The following is a list of foods to avoid, but are not necessarily poisonous.